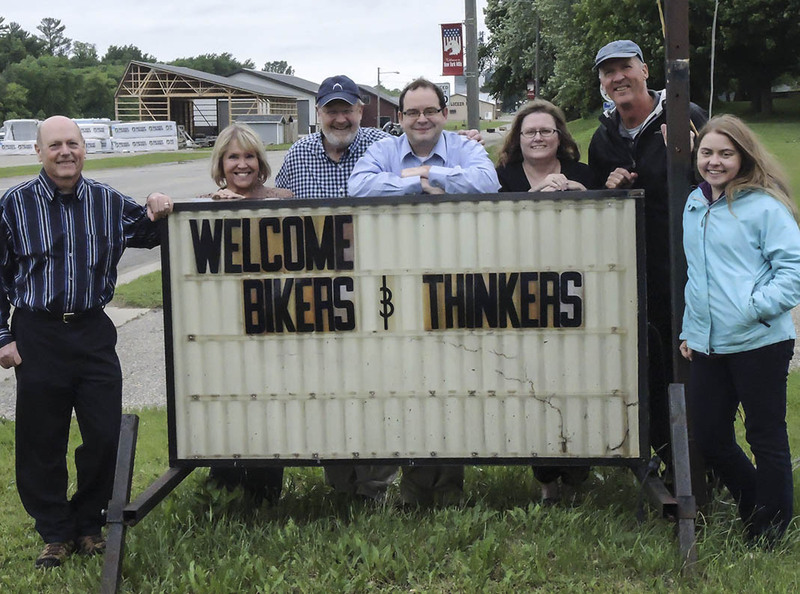 L to R, Don Niles, board member; Alice Martin, chair of Think-Off committee; Jamie Robertson, executive director; Jason Steck, Therese Helker, Paul Terry, Jennifer Nelson, Think-Off final four. Jennifer Nelson of Morris, Minnesota won the annual Great American Think-Off philosophy contest on Saturday, June 14 before an enthusiastic crowd of 375 persons in New York Mills, Minnesota. Jennifer won the contest with her effective argument that love motivates us to act more than fear. She based her essay and her case in her personal experience recovering from an automobile crash in 2004. Jennifer completed a master’s degree in public policy from the Humphrey Institute of the University of Minnesota this spring and she won the audience’s support Saturday night with her compelling personal story about overcoming fear and recognizing that love empowered her to live fully once again: “Immediately following my accident, I had assumed that I would need to find a way to fix all [my] problems and be free of them before I would be able to experience love. During the decade that followed, instead I learned that it was love that provided me freedom in spite of these problems and pain. Jason Steck won the silver medal Saturday night for his assertion that fear motivates us more than love. Jason argued very effectively that fear need not be “a pessimistic vision. In our lives and our society, we will always fear the darkness, but we respond by building a light.” Jason lives in Minneapolis and works as a judicial law clerk for Judge John P. Smith of the Minnesota Court of Appeals. Last year’s winner, Paul Terry, argued that fear “delimits action and serves as a catalyst for action at the same time.” As chief science officer of StayWell Health Management, Paul sees first hand that everyone’s motivation to lead a healthier life style is increased by the fear of the possibility of bad news from their doctor. And Therese Helker of Pine River, Minnesota offered a compelling account of a difficult childhood governed by fear. That fear led to inaction, Therese argued, and was overcome by her choosing love over fear in her life. She practices that belief in her career as a hospice chaplain for Alina Health. The Great American Think-Off is a program of the Cultural Center in New York Mills, Minnesota. The debate this year was among the most memorable in recent years and will be featured in a podcast being produced by independent journalist Evan Johnson, an instructor at Normandale Community College. The podcast will be available through the Cultural Center website in late November, 2014.